It's time for a new log and this year's crazy venture is a set of Mandalorian armour. Some of you may be asking what happened to my stromtrooper amrour. Well I still have it but have made no progress in about 2 years. The main reason for this is that because of how the plates fit together at the side, I need to get into much better shape before I can achieve a look I'm happy with. However, the mando armour involves a lot more soft parts so that hopefully won;t be an issue in this build. 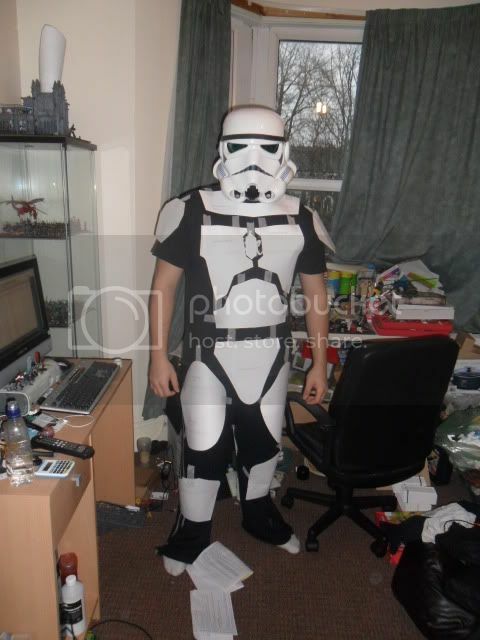 I've learnt a lot since trying to build the trooper armour and a project like this offers so much more flexibility in terms of what you have to have to pass the requirements to join, as well as scope for creativity. 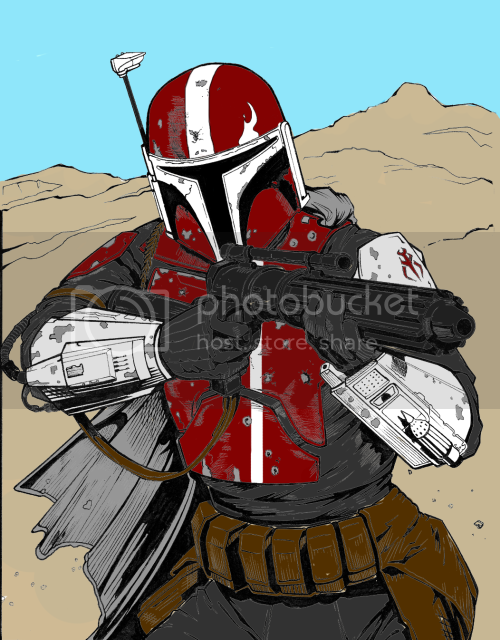 So I had a think about the colours for my armour last night, found a Boba Fett ink and coloured it in photoshop to mock up the scheme. After looking at a lot of build threads I think I'll be making my armour out of plastic (most likely cut from the body of some poor household item) and buying a helmet. The biggest issue this route presents is the gauntlets. I'm not too sure whether I'll be able to build gauntlets like Boba's, and I think (not finished looking yet) buying them would put me over budget much faster. I've a few ideas as to how to get around this. One of which is cannibalising parts of my trooper armour for the project, which I'm reluctant to do as I'd like to return to that one day. Another idea is building a arm frame to heat mold some plastic around and then build up the shapes of the gauntlets with clay and all that good stuff. In terms of soft parts, I'm pretty sure I'll be getting this: http://www.amazon.co.uk/Designed-Prestige-Boilersuit-Coverall-Overalls/dp/B00617QDOI/ref=sr_1_1_m?s=clothing&ie=UTF8&qid=1362687162&sr=1-1 to use as my undersuit. I have no idea what to do about the vest yet, but I'm pretty sure I'm going to use snaps to attach the plates to the vest, which will allow me to totally dismantle the armour for transport, should provide a strong bond and mean I can swap out plates if I upgrade etc. For the cape I'll probably pick up a heavy thread bed sheet, dye and weather it and snap it to the chest. I won't be going with a jetpack (another cost saving/skill measure) so my back plate will probably have the UK clan logo either painted on or built up with plastic. Those are my ideas so far. Comments, criticisms and help in general will be greatly appreciated! The best way to make one of these outfits is with plaster strips, and fiber glass. Then use a type of rubber that can be cast to make some of flexible parts. I myself am starting a project to make a cybernetic looking arm armor following the design shown in MGS rising. If your going to invest the time in doing something like this you should do it in such a way that the end result is worth the investment. If you look online their are lots of cosplay and theatrical guides to making awesome looking custom costume armor. I know it will cost more, but luckily its done in relatively cheap stages so you can keep costs down by splitting the project across 6 months. For the armour plates themselves I'll definitely be using the bin method. 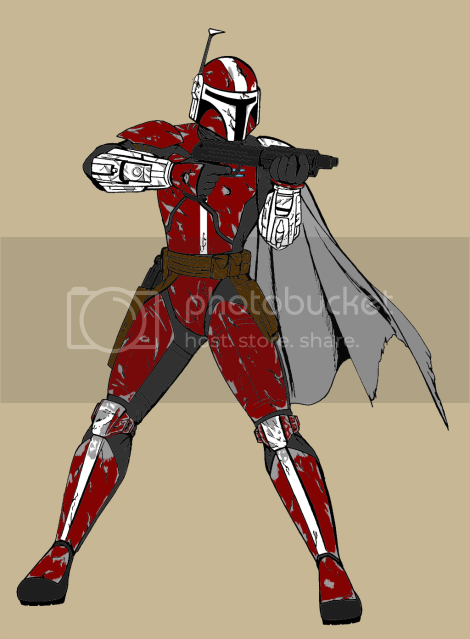 I've seen a lot of build threads on the Mandalorian mercs forum where people have used it and it produces fantastic results. It's all in the painting, as long as you nail the paint job, no one will tell you're wearing a £6 bin for armour. The method involves printing templates, taping them to the bin, cutting them out and tidying them off, sanding them then painting and weathering. I may use pepakura for the gauntlets, either that or I'll be heavily customising pvc pipe and guttering. I'll be picking up the bins next week hopefully, and getting started on the plates. 3. Leave in one piece, big enough to go over your hand, and then bulk out the wrist afterwards to prevent it sliding off. I haven't given a massive amount of thought to how I'd do it in pep. But I'd probably do then in a single piece just wide enough to get my arm into, and fill the gaps with padding. My trooper gaunts are two separate pieces that attach via Velcro and they're always a pain to put on. Here's another concept (the ink is shamelessly lifted from the internet, colour was done by me) that shows the colour scheme more completely. I'm going for full lower body armour (jango style) as I think it makes the piece more even and not so top heavy. Wearing my trooper helmet to help balance the scale. Going to start cutting the actual plates tonight! Look forward to seeing this done! I'm trimming them with my citadel clippers which takes quite a long time, and hurts my hands like hell. But I'm familiar and comfortable with them and know I can get a good line using them. I'm hoping to have all the plates trimmed by mid week and then think about forming them into shape. Then it'll be time to buy the soft parts such as flight suit, vest and boots. Looks excellent, great to see you doing the armour yourself having looked for DIY mandalorian armour all over the internet and only finding expensive bought resin parts. Going to have a crack at this myself, how are you doing the jet pack?